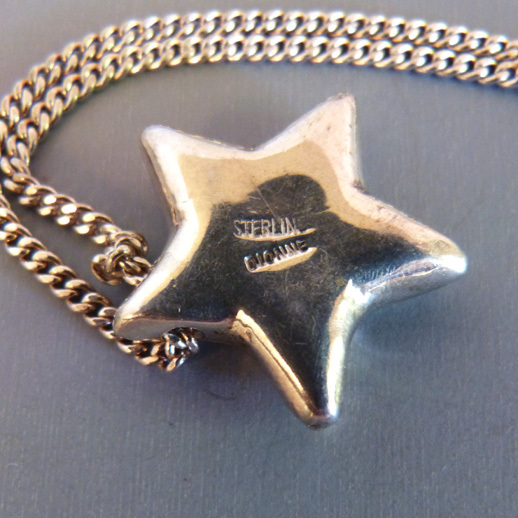 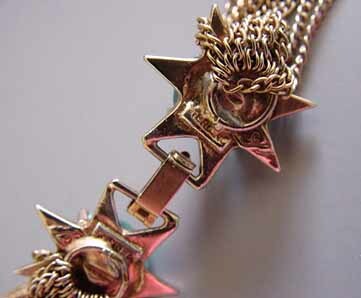 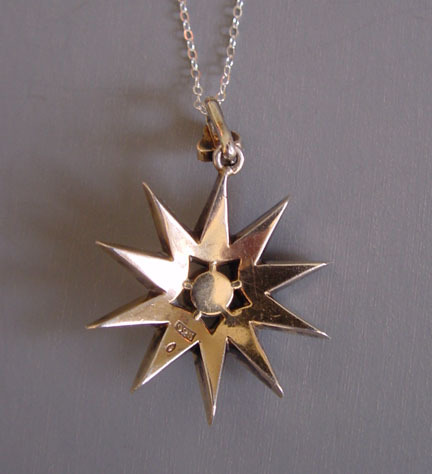 STARS, symbol of light in the darkness, hope, the highest point man can reach. 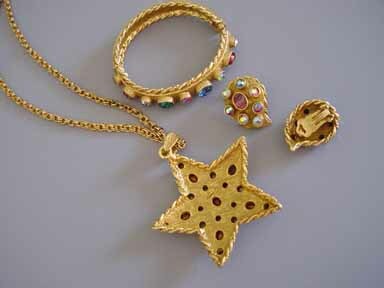 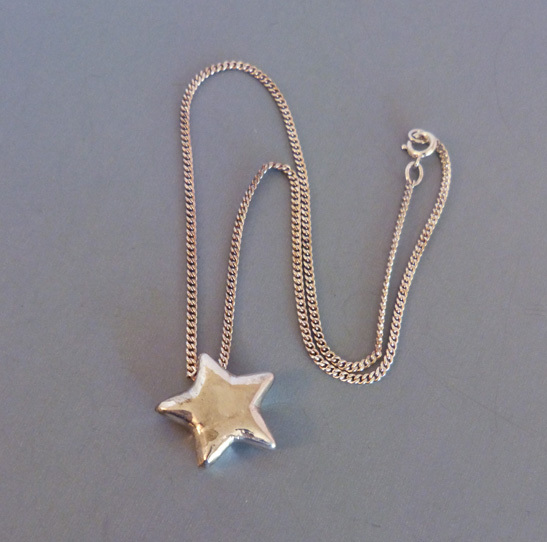 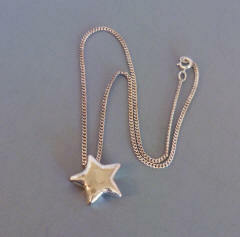 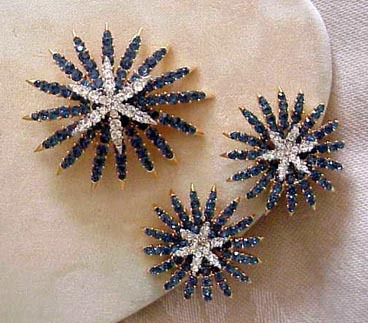 Sparkling, brilliant and mysterious... a perfect shape for jewelry. 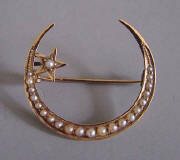 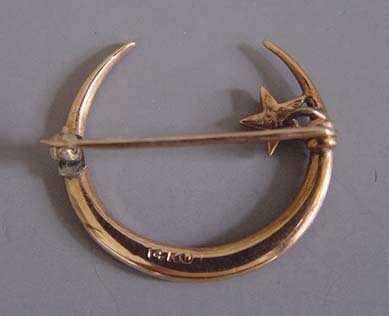 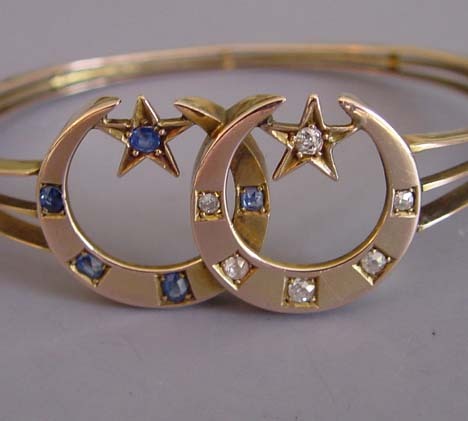 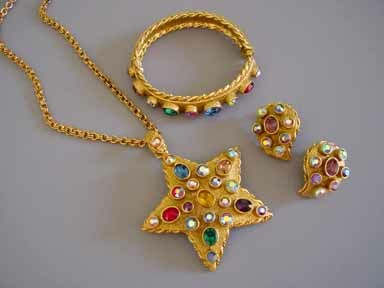 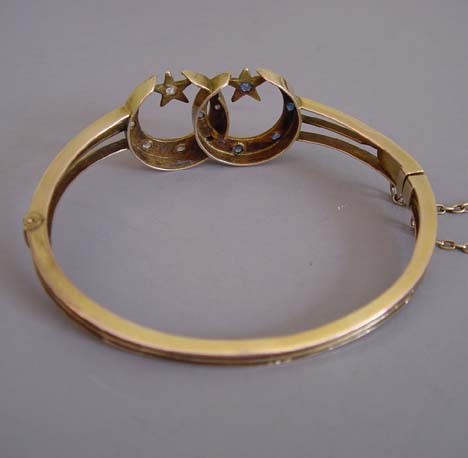 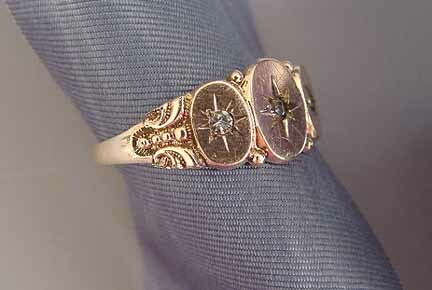 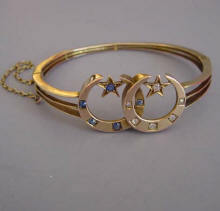 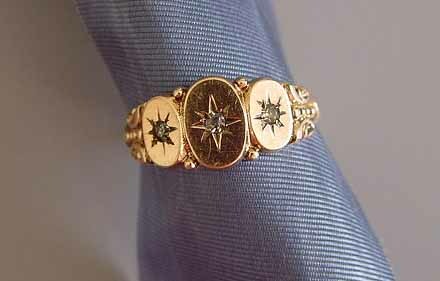 Moons and crescent moons symbolized everything including the mystic, the romantic and the feminine. 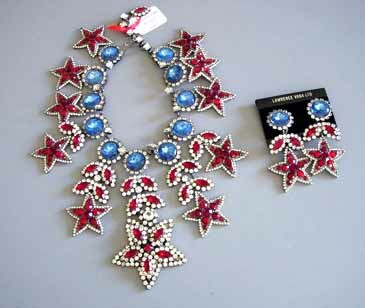 And comets flash through the sky as well as ride on a jacket. 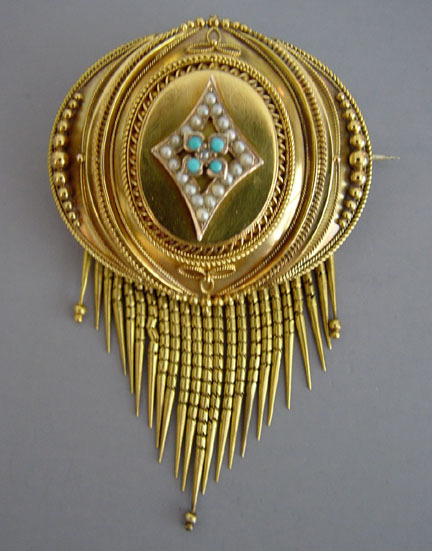 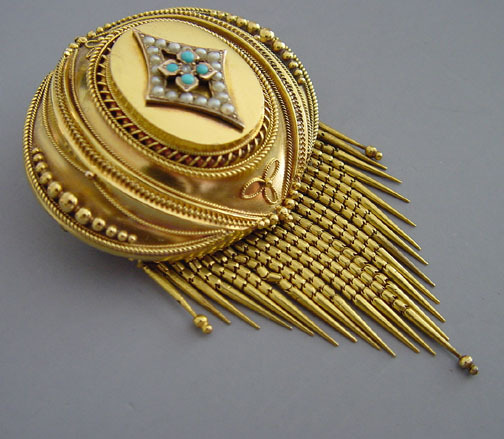 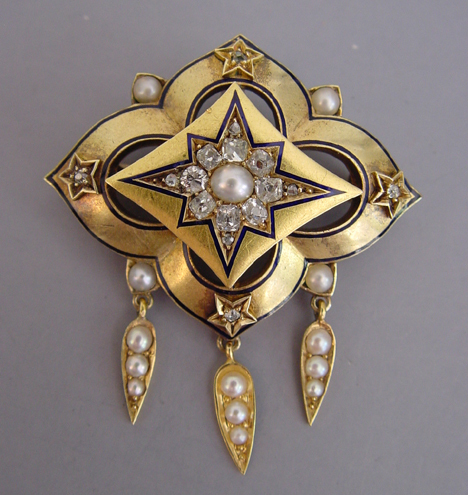 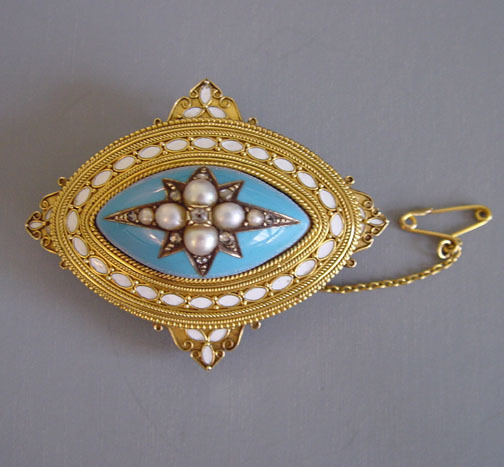 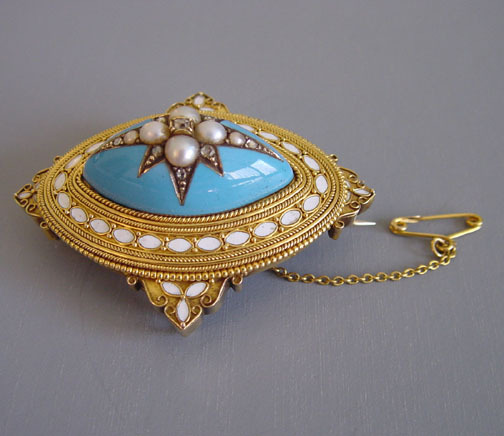 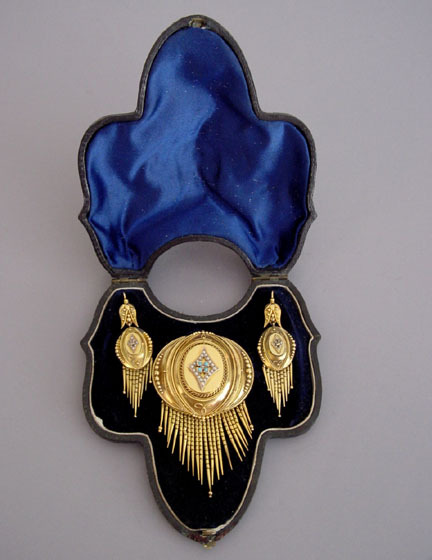 VICTORIAN 15 carat yellow gold eye-shaped high domed brooch with cannetille work, aqua and white enameling, nine rose cut diamonds and four pearls as accents set in a star, delicate wire and bead work in the gold, circa 1870. 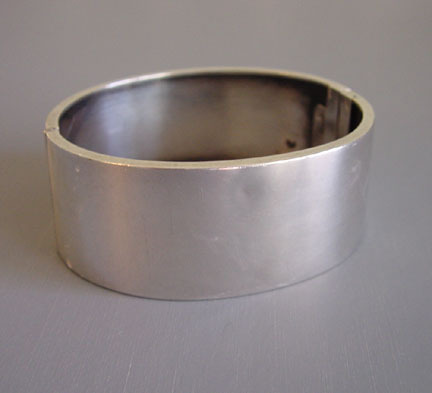 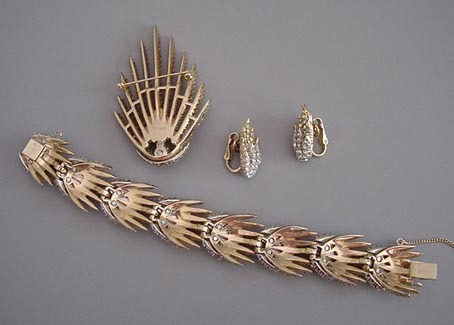 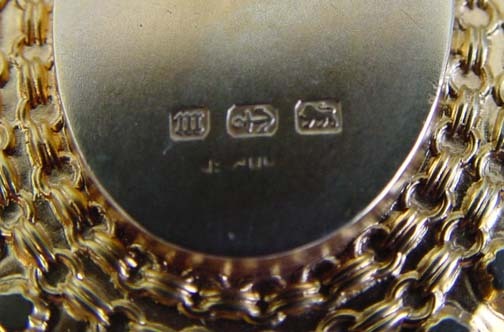 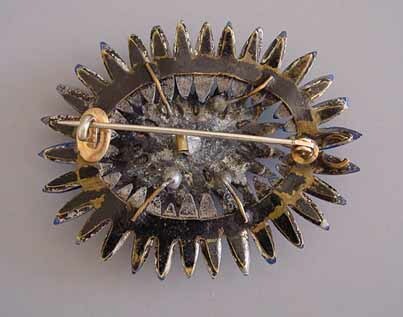 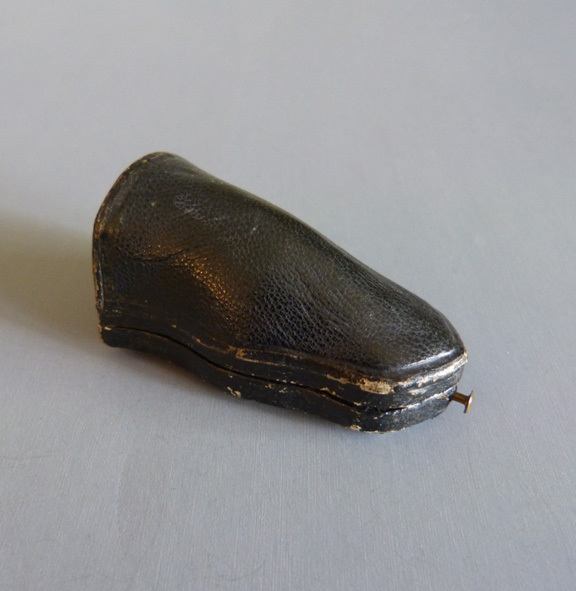 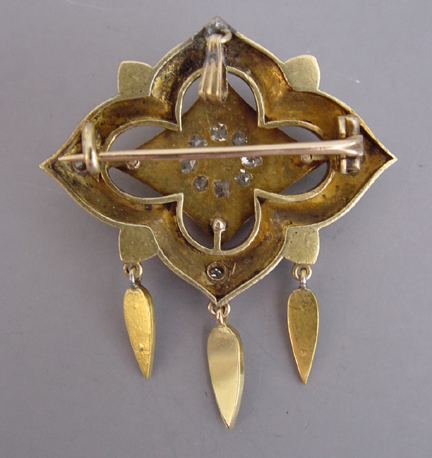 The brooch is 1-5/8" by 2" and 3/4" deep. 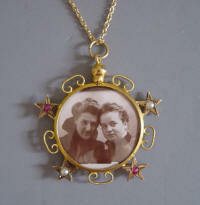 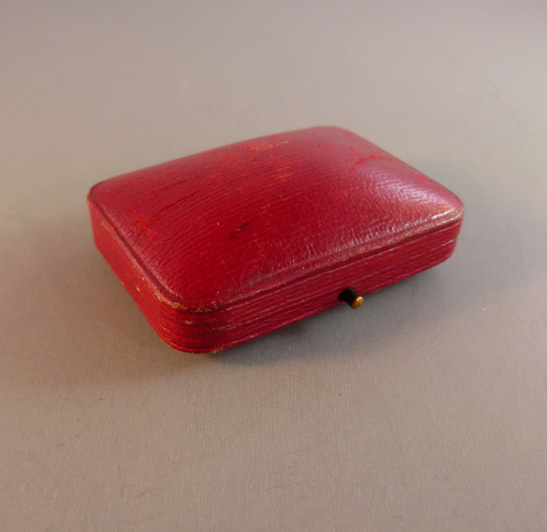 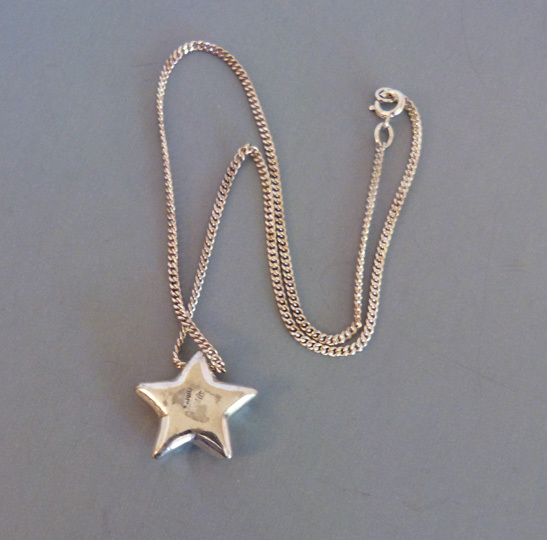 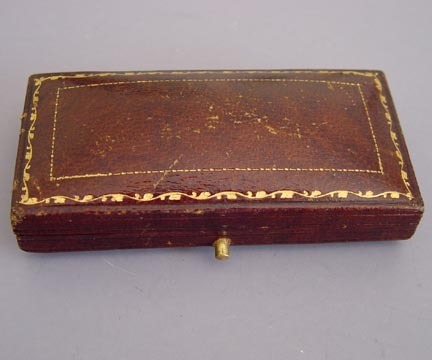 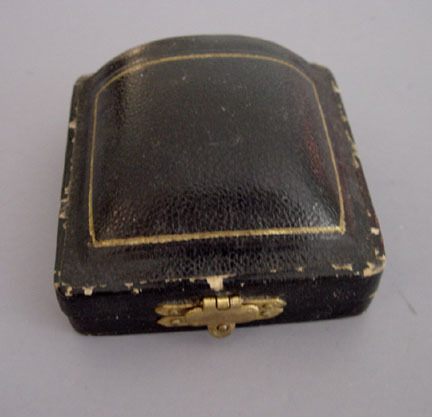 There is hook on the back to hold a pendant watch and a compartment to hold a tiny photo or lock of hair as well as a safety chain. 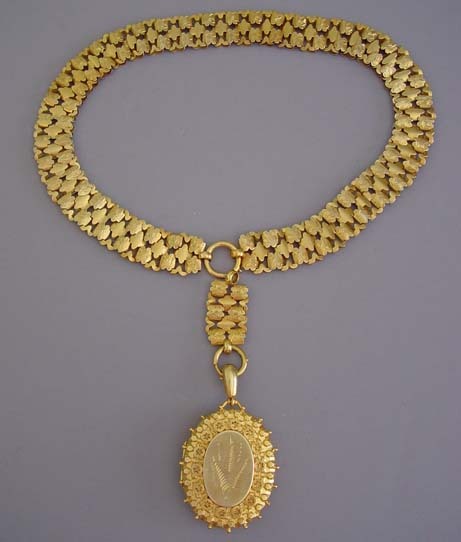 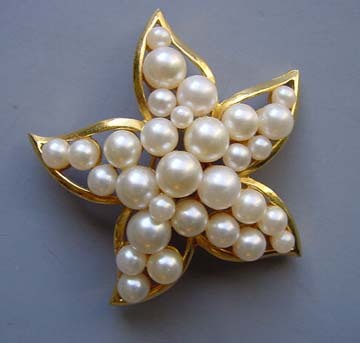 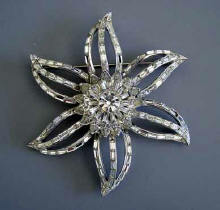 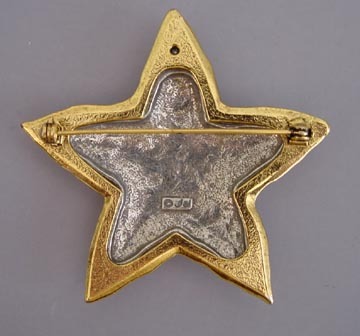 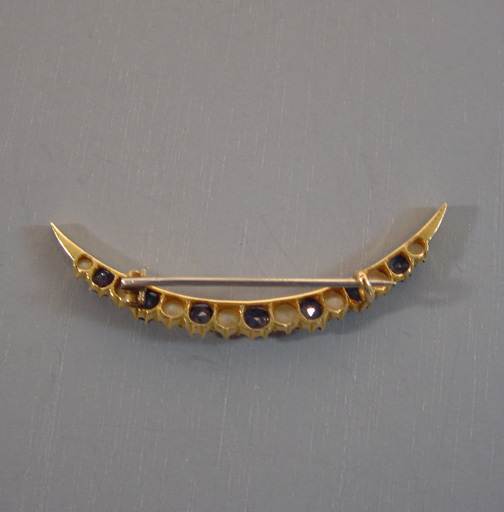 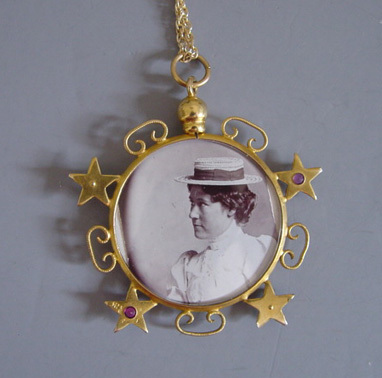 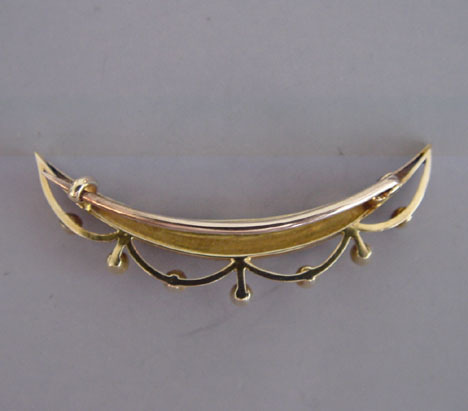 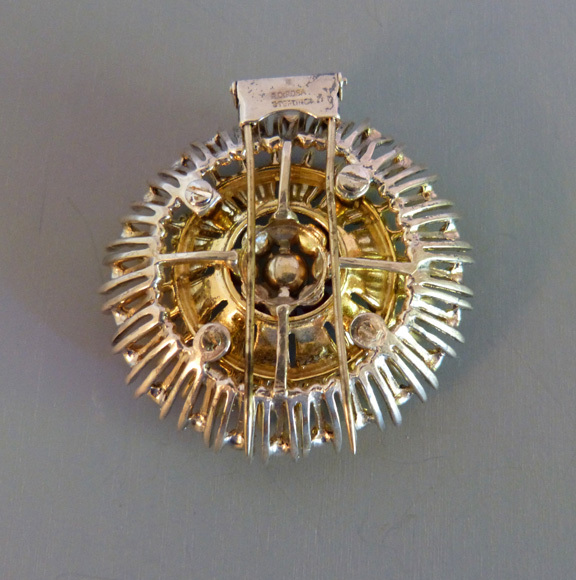 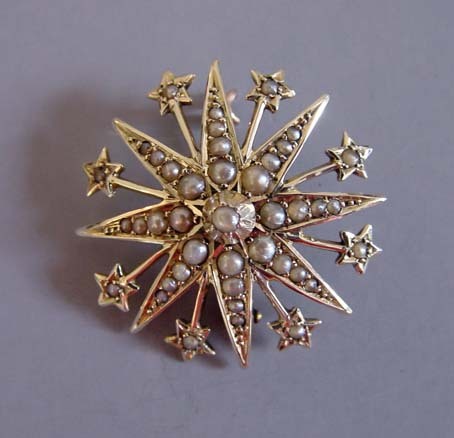 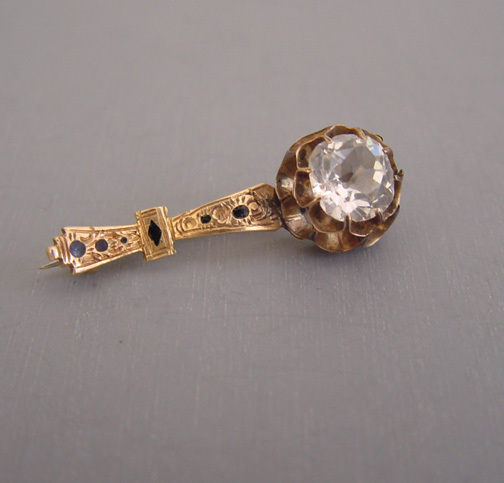 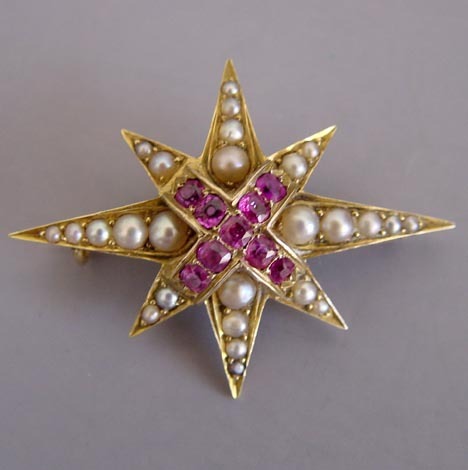 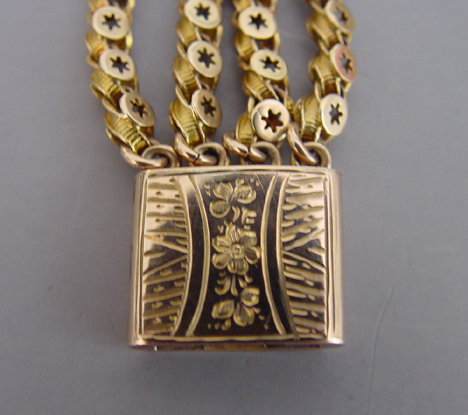 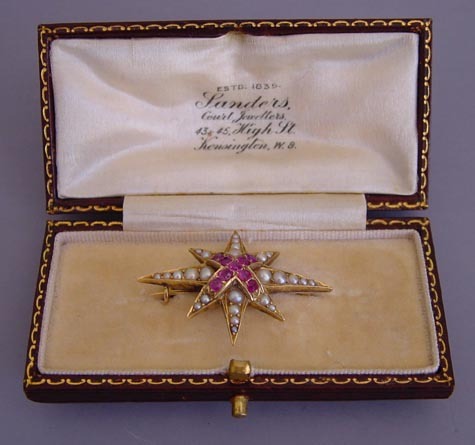 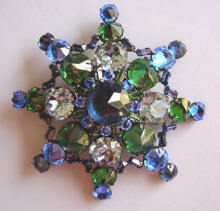 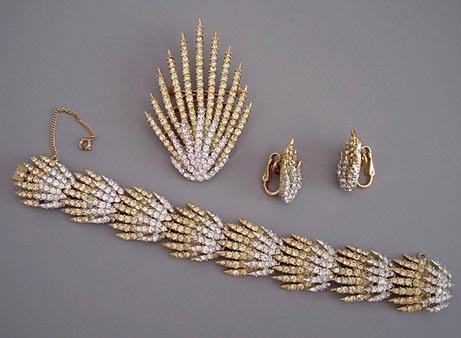 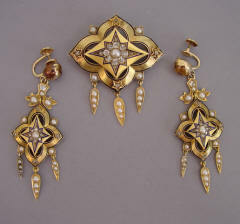 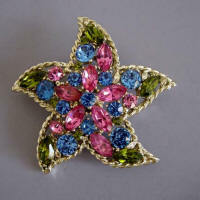 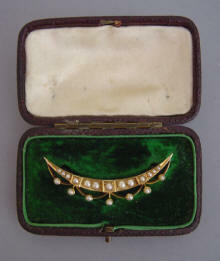 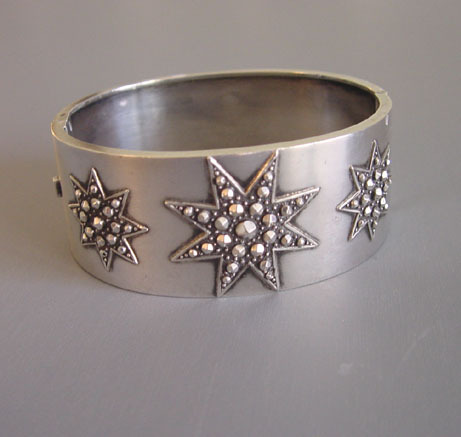 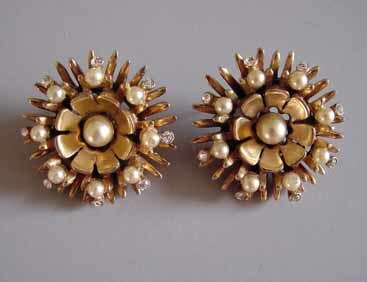 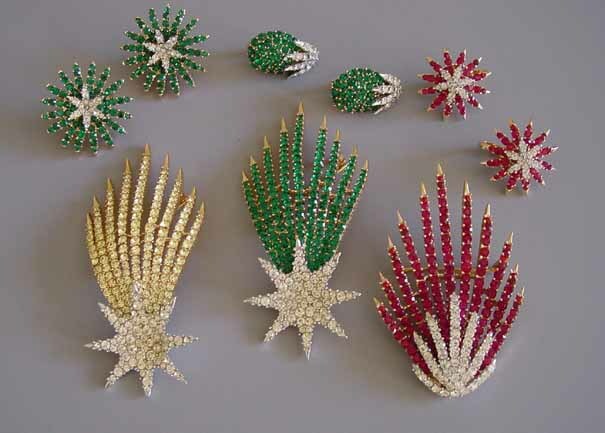 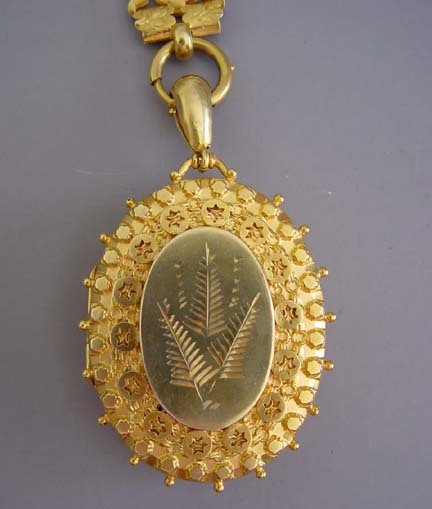 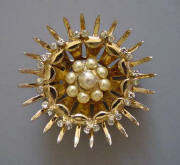 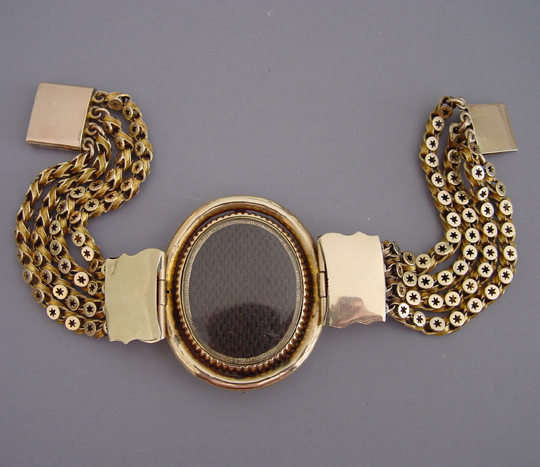 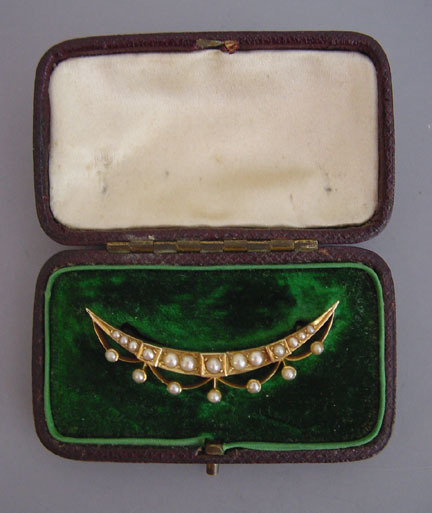 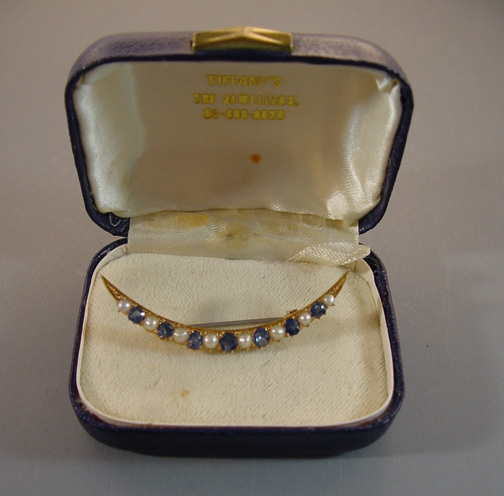 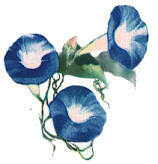 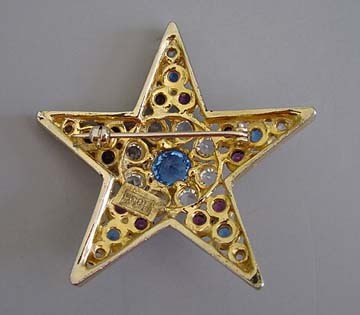 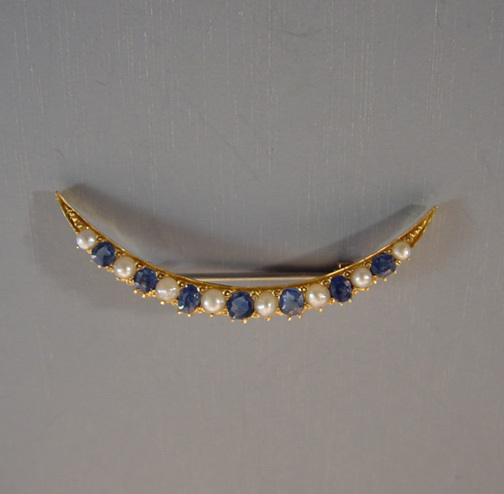 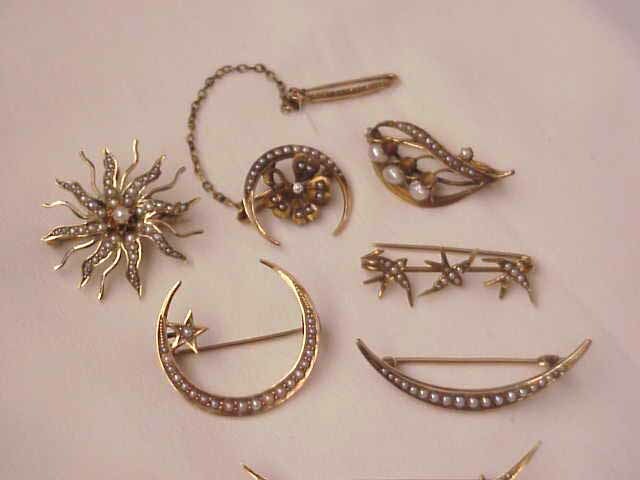 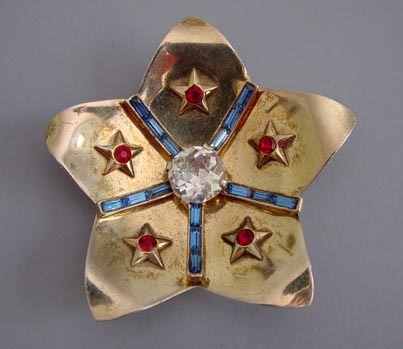 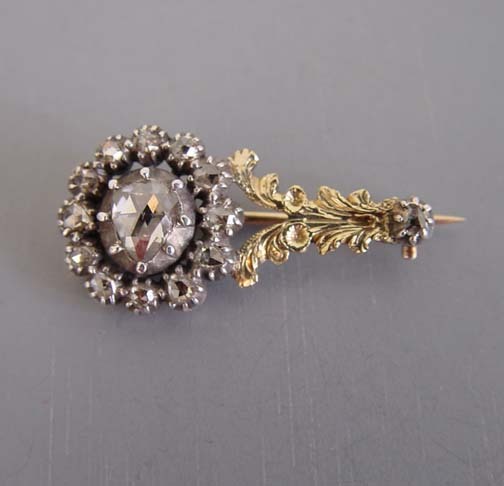 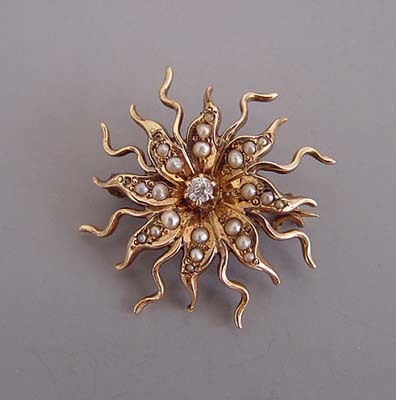 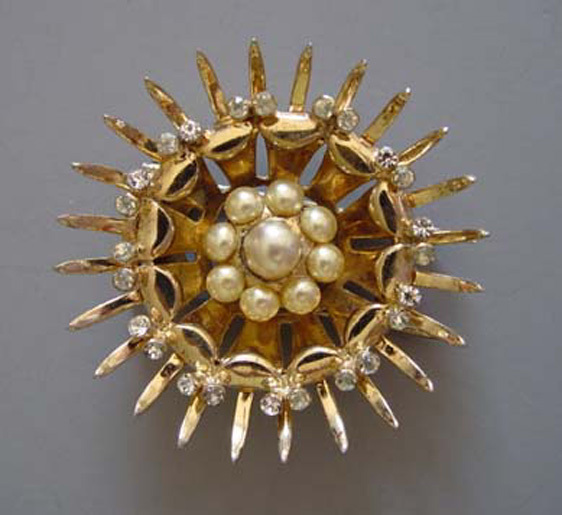 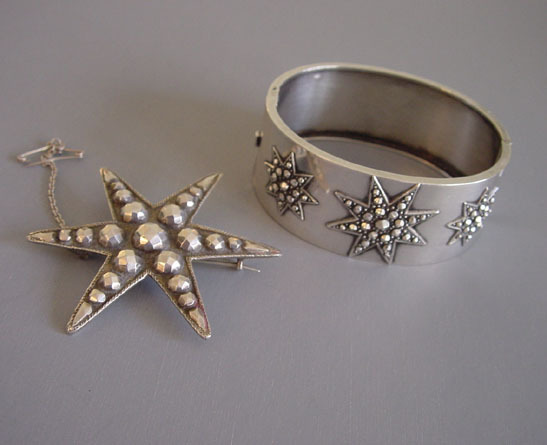 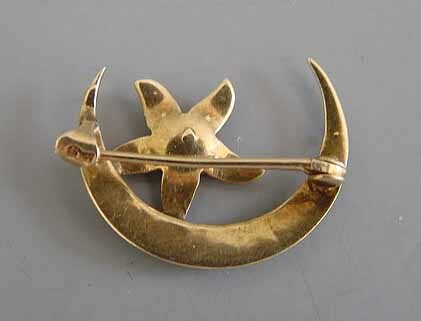 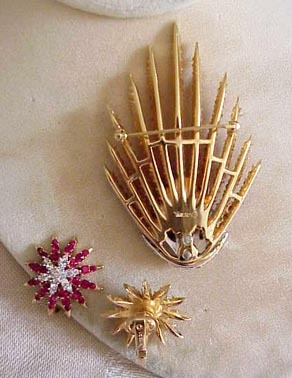 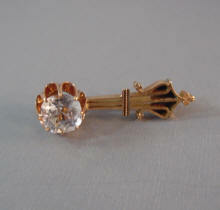 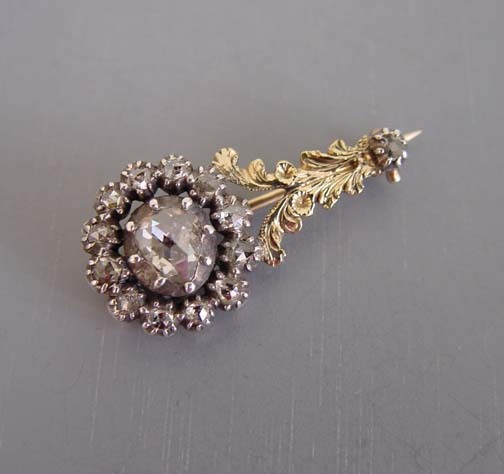 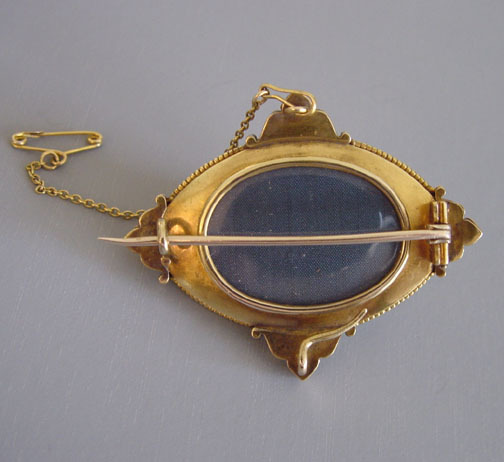 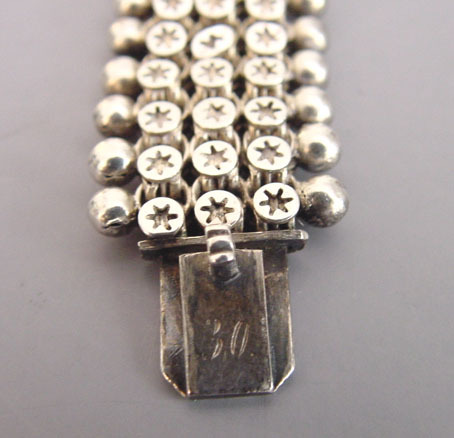 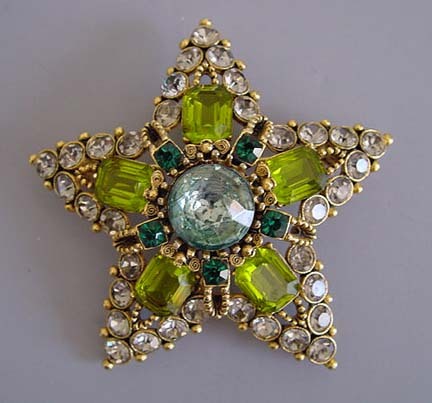 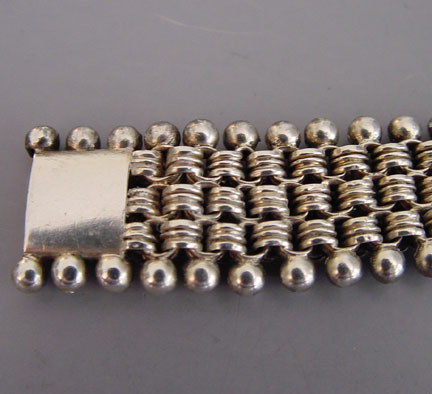 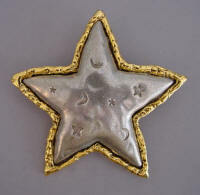 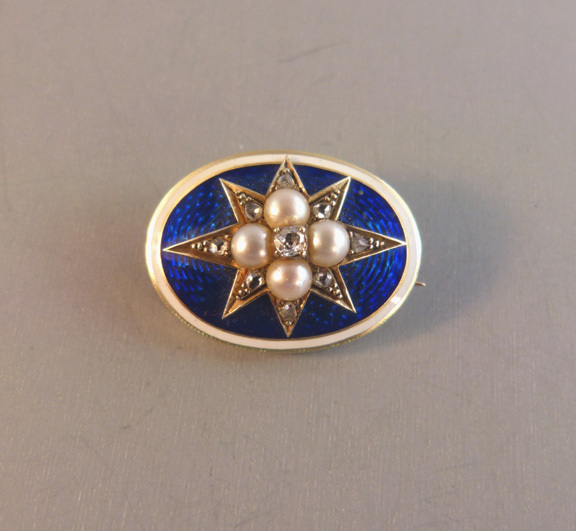 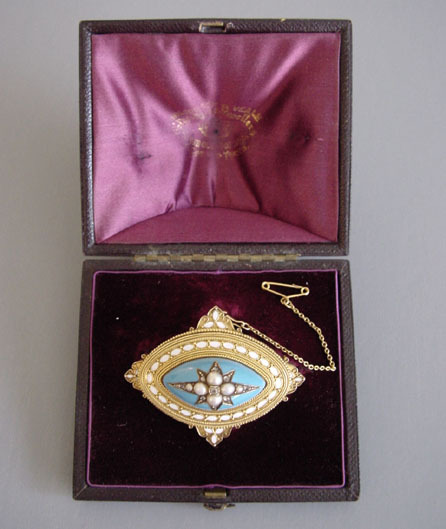 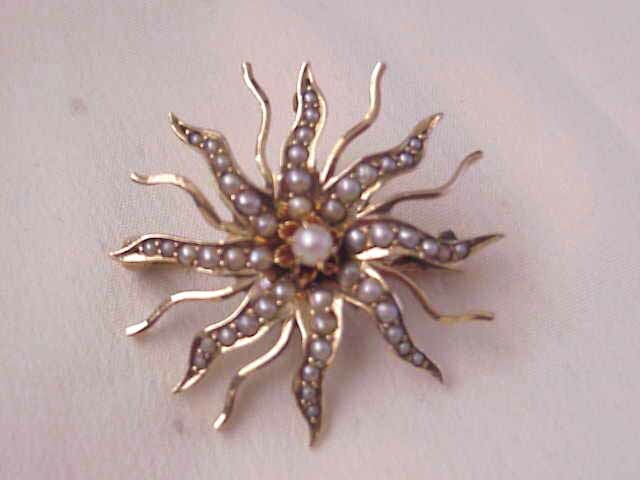 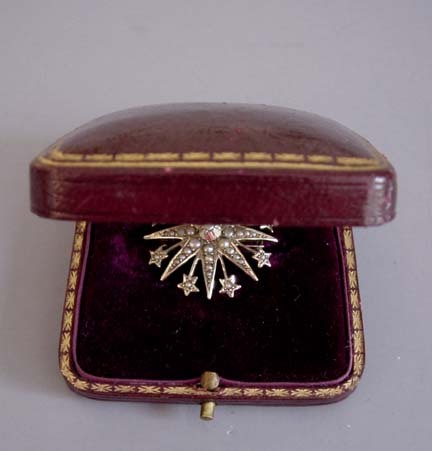 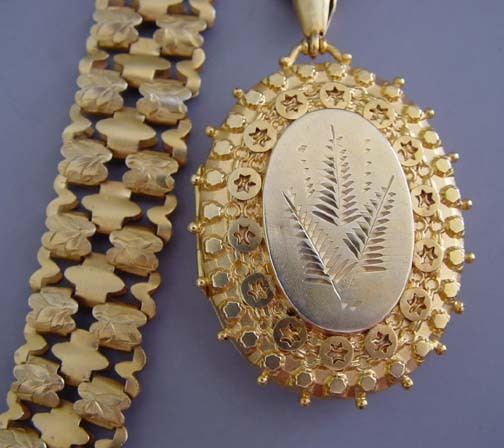 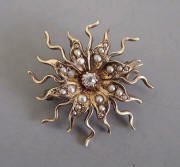 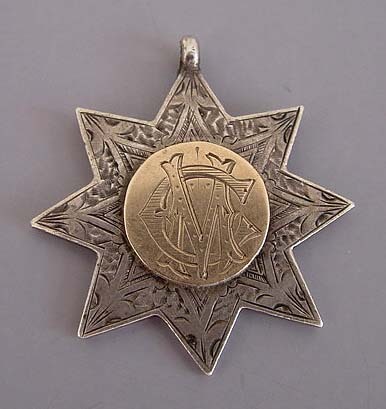 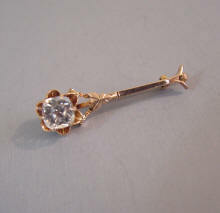 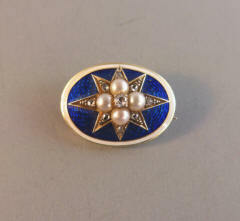 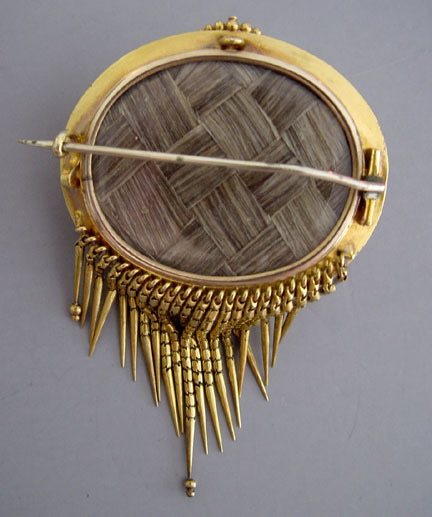 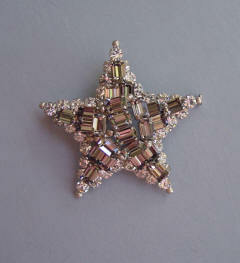 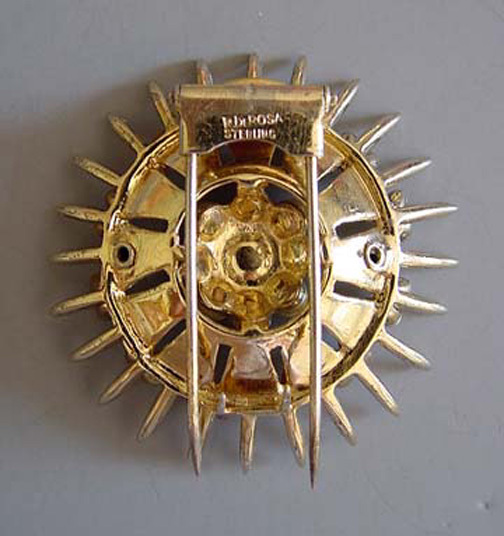 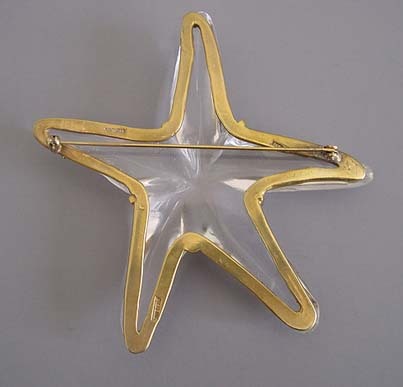 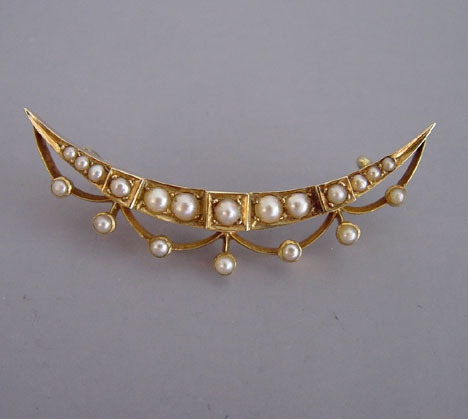 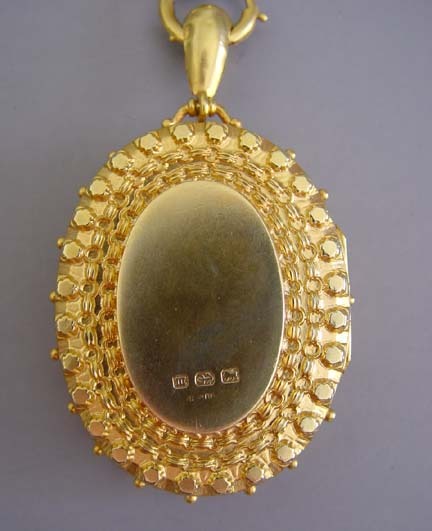 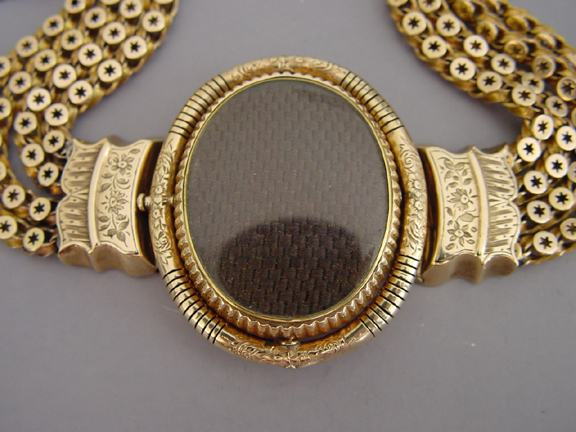 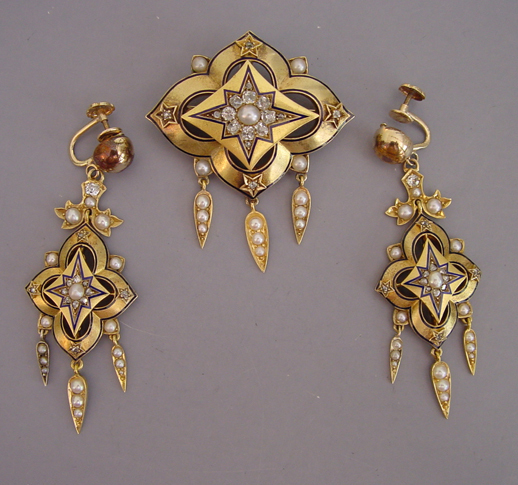 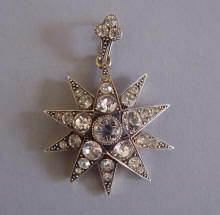 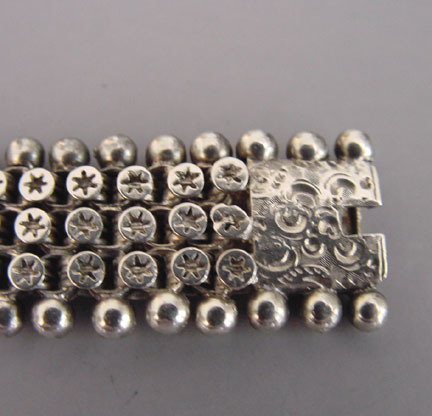 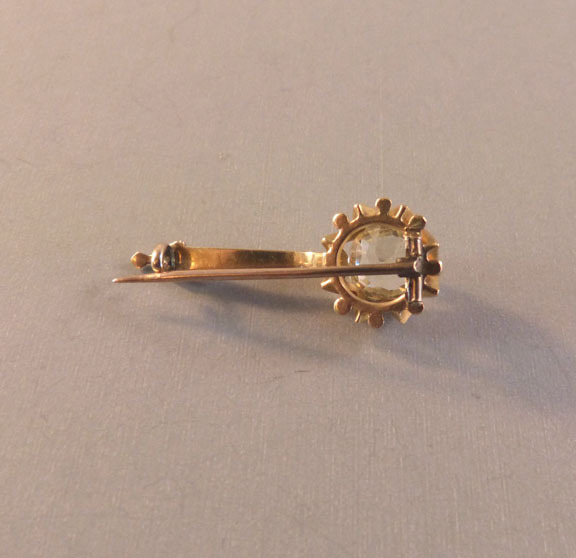 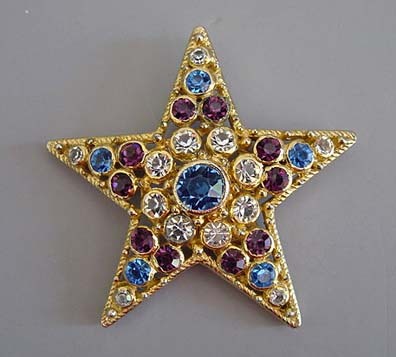 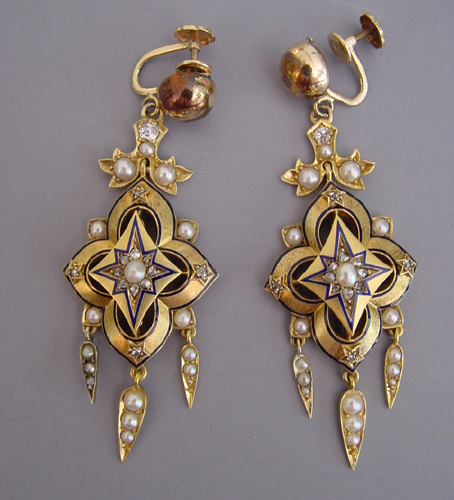 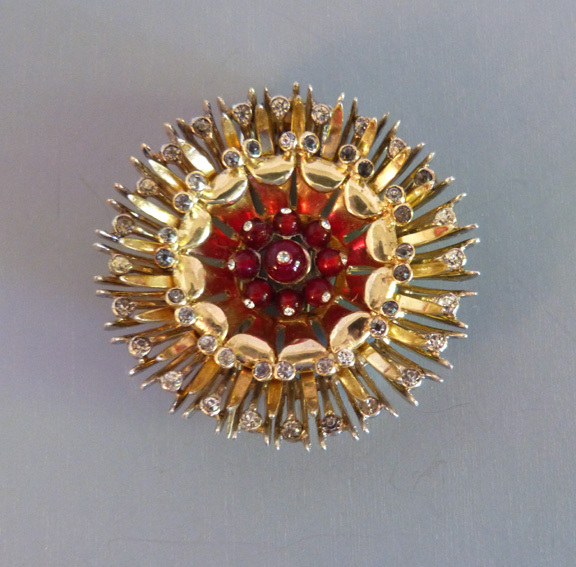 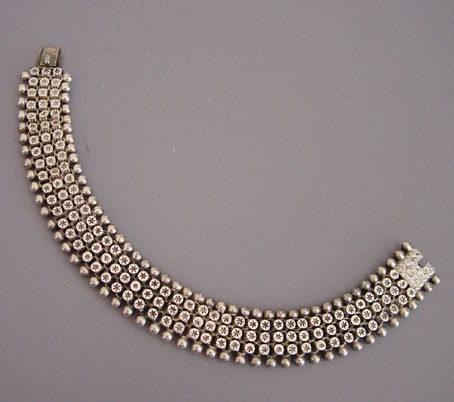 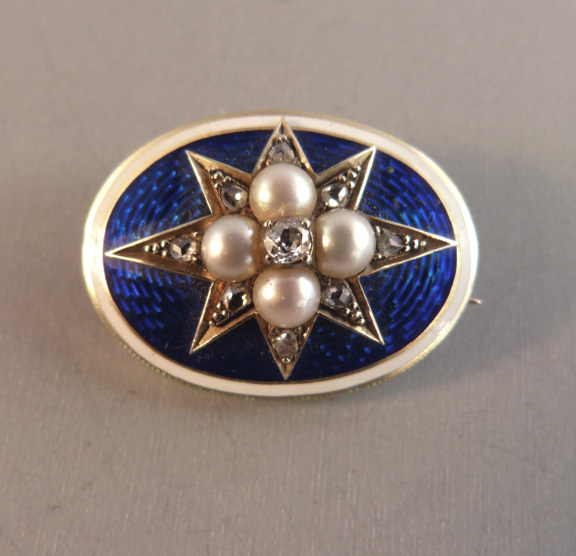 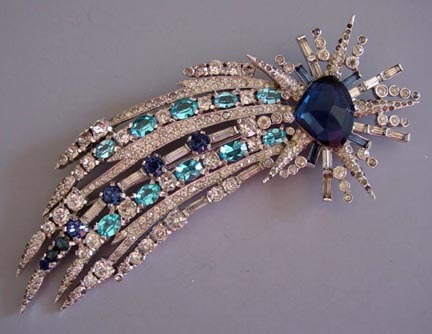 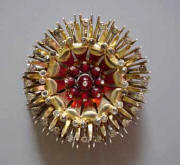 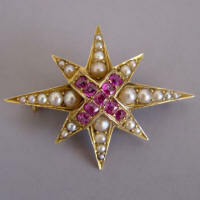 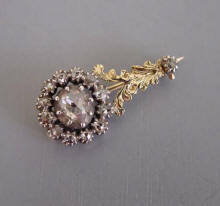 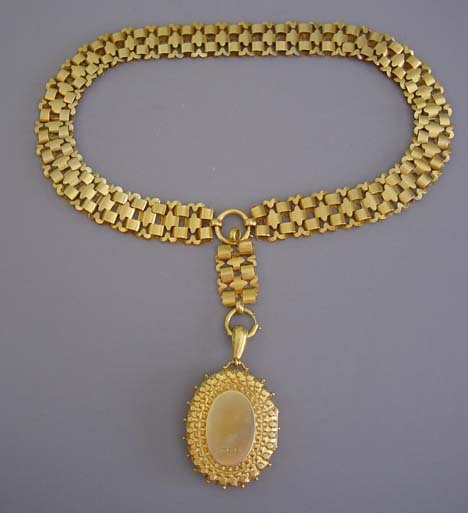 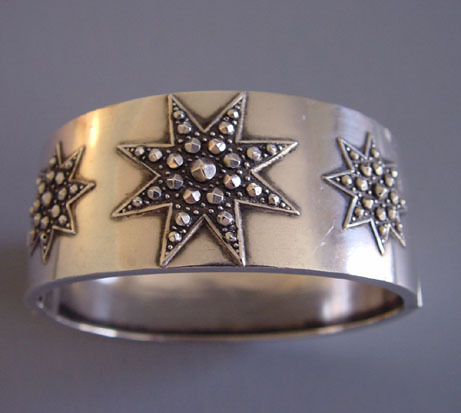 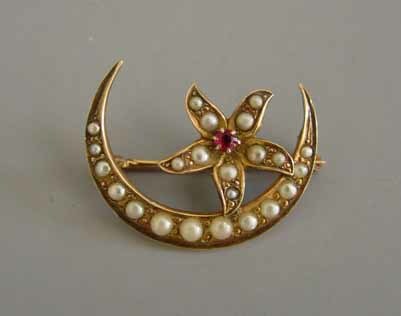 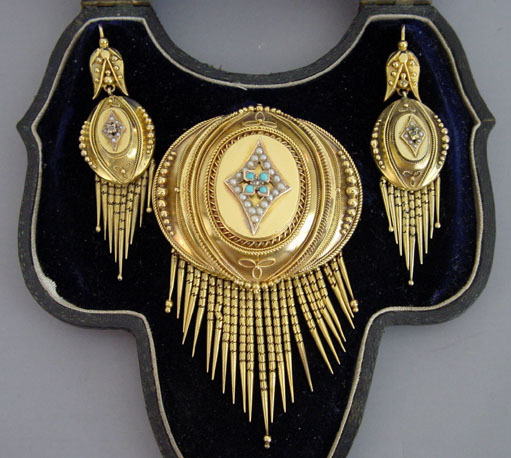 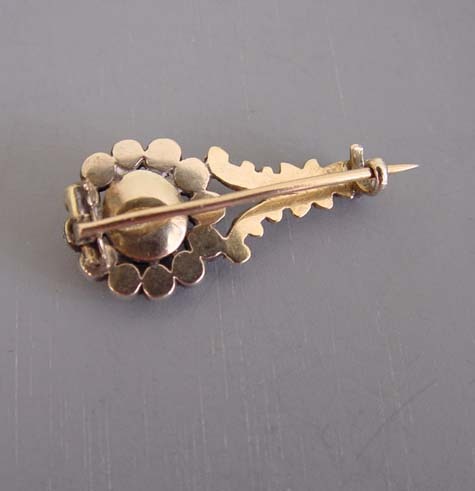 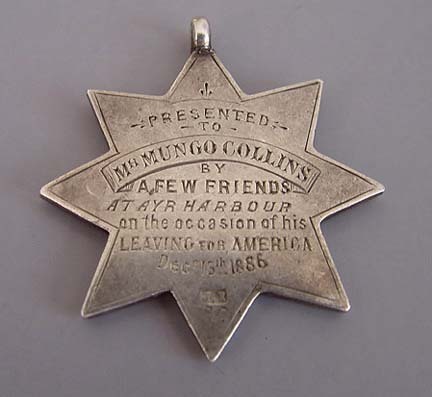 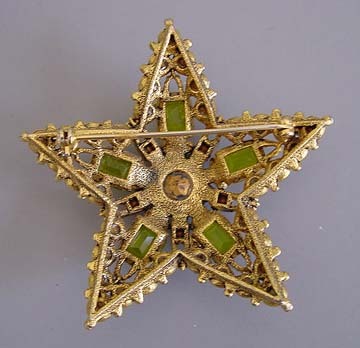 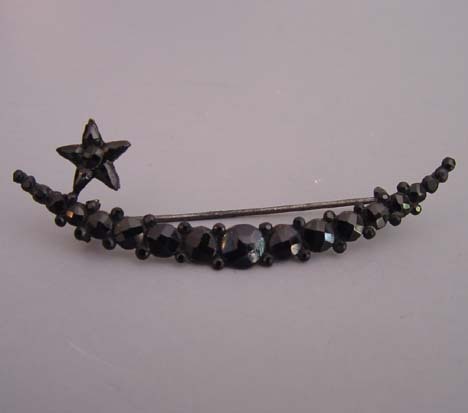 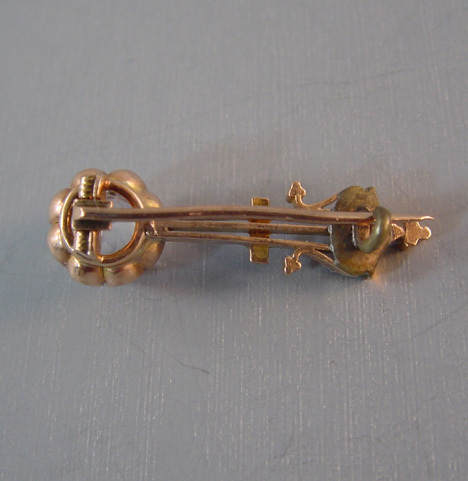 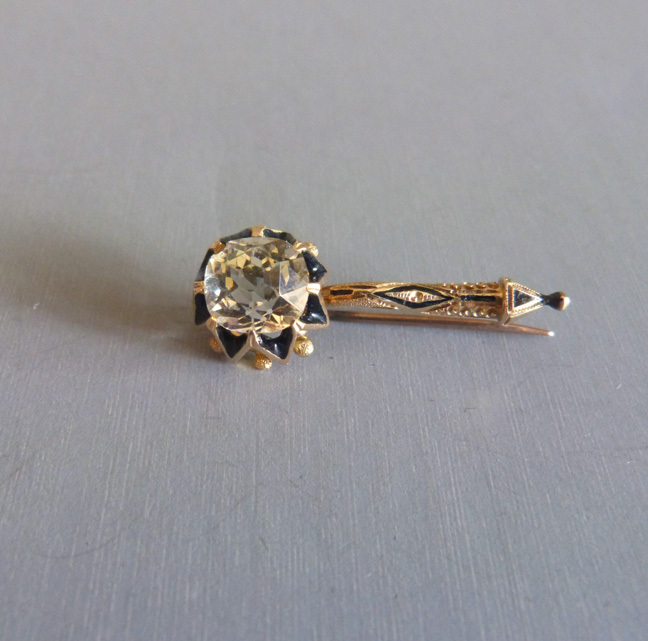 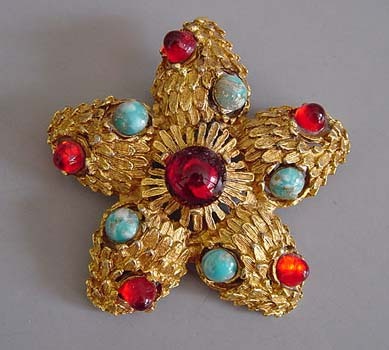 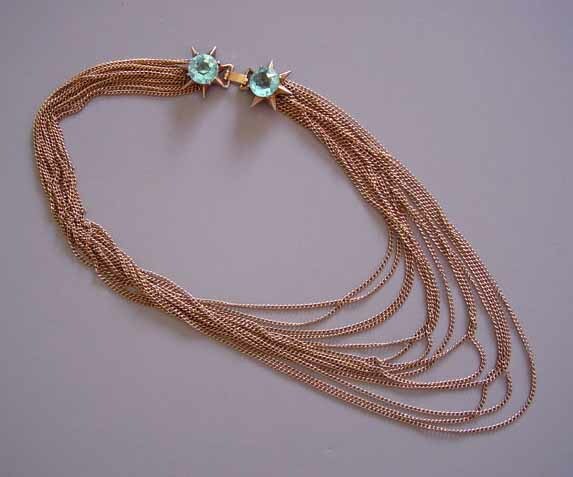 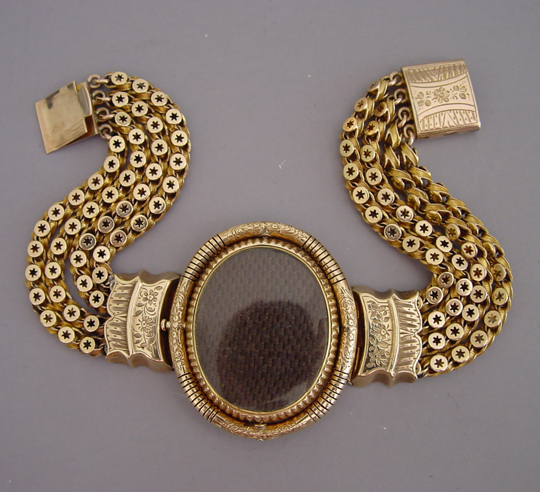 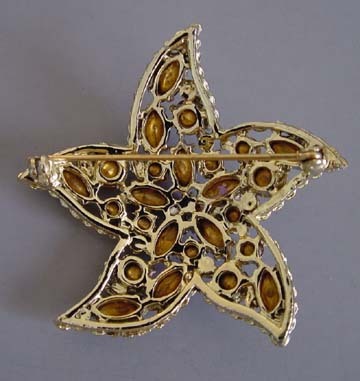 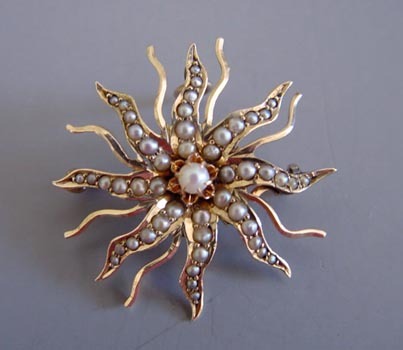 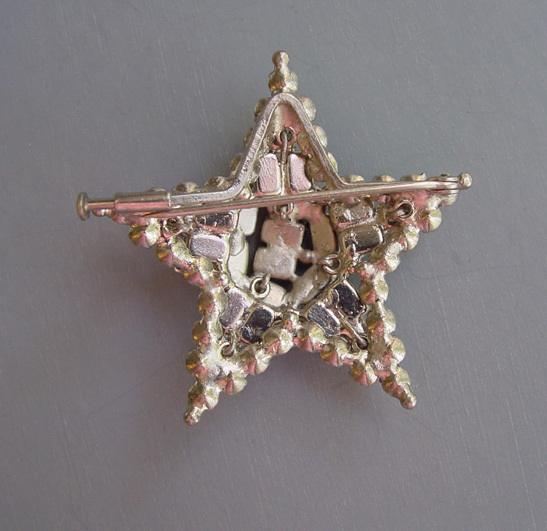 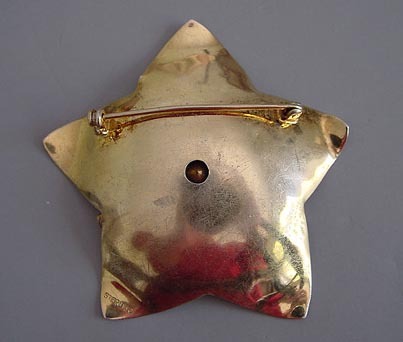 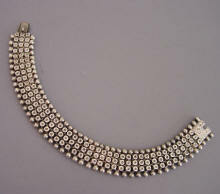 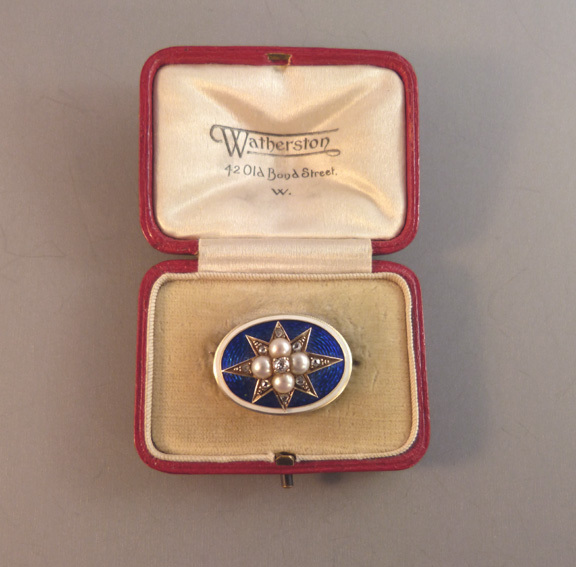 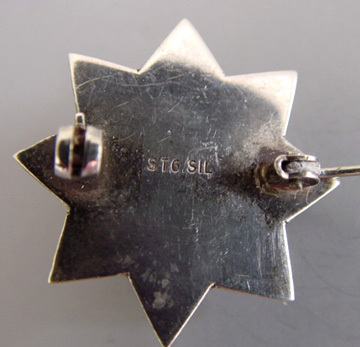 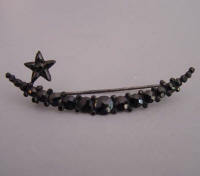 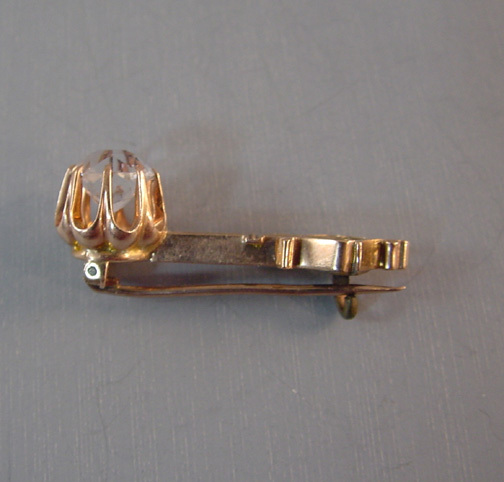 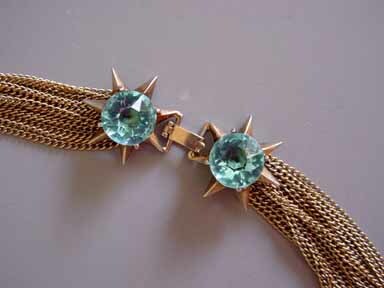 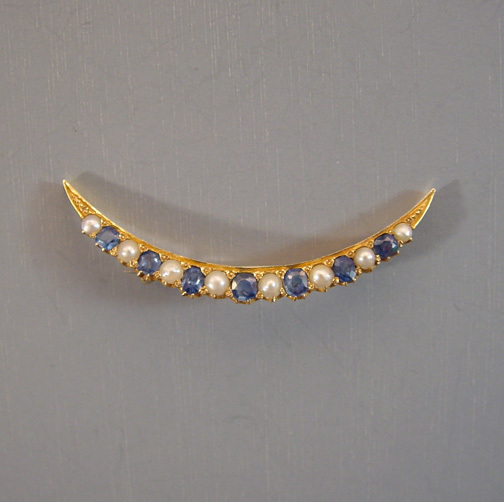 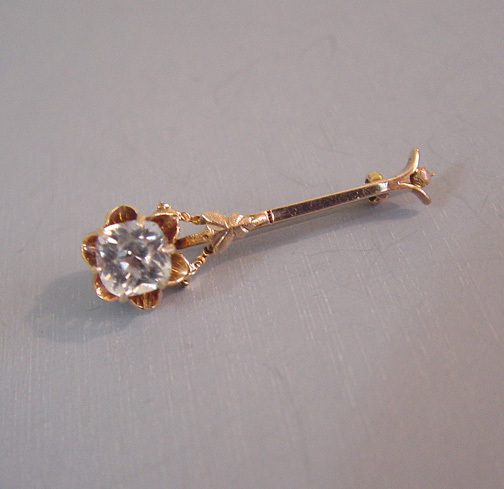 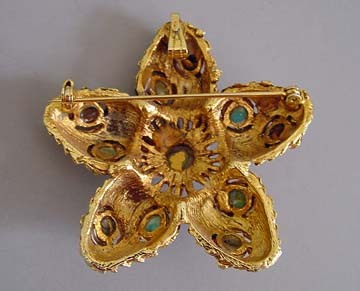 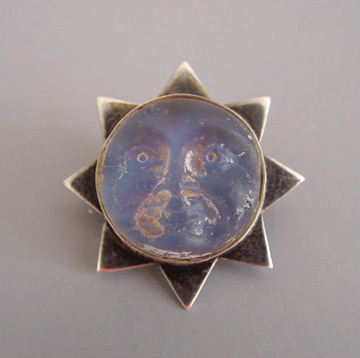 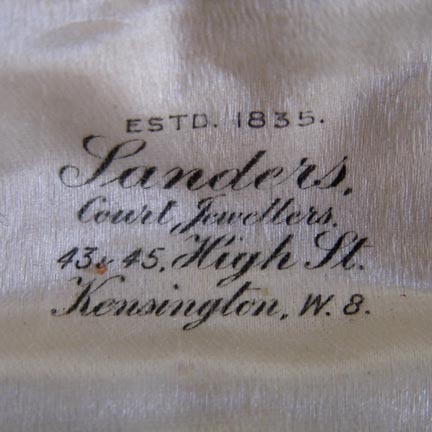 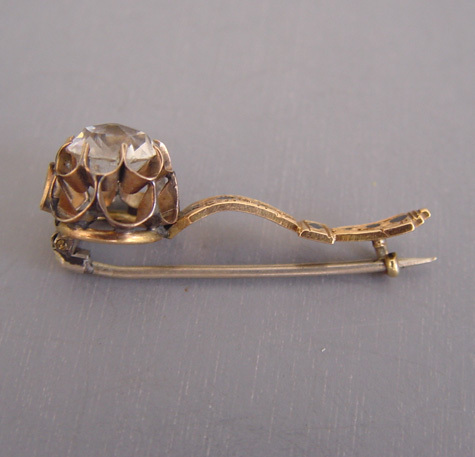 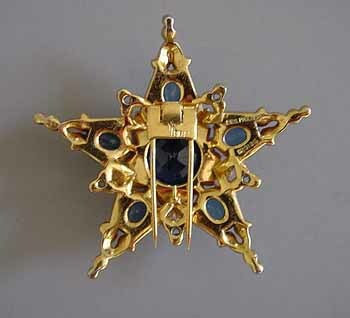 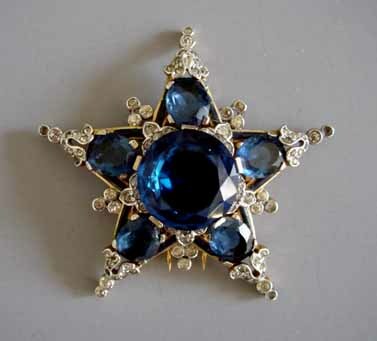 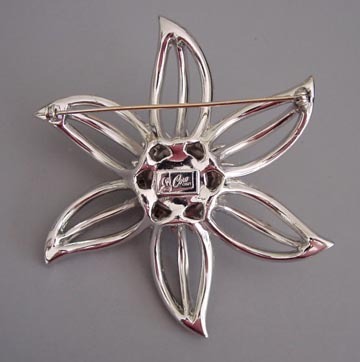 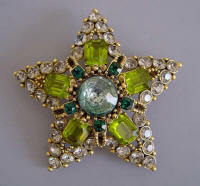 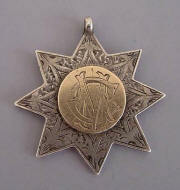 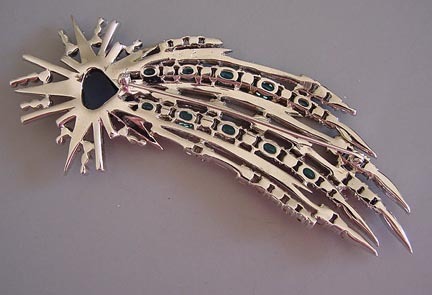 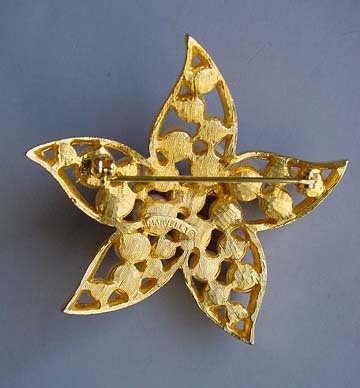 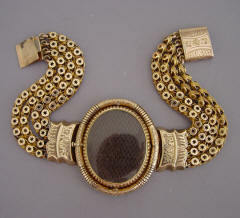 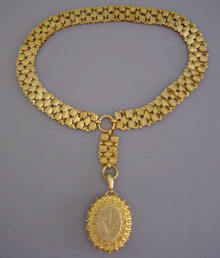 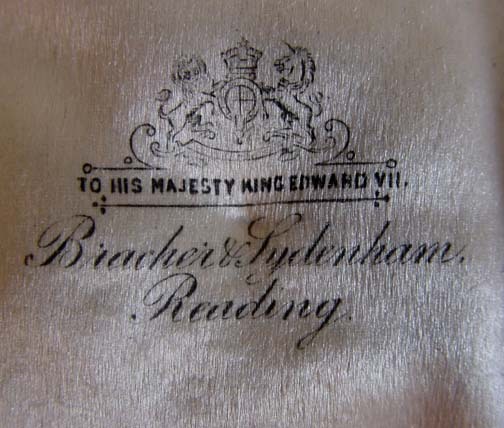 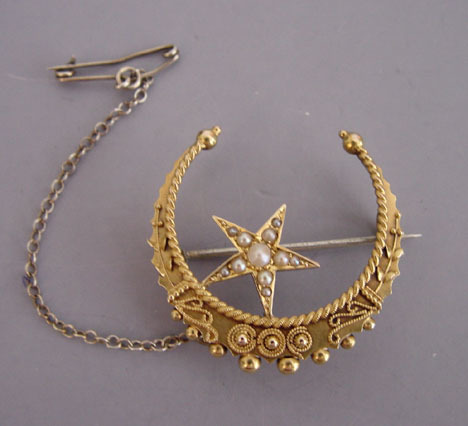 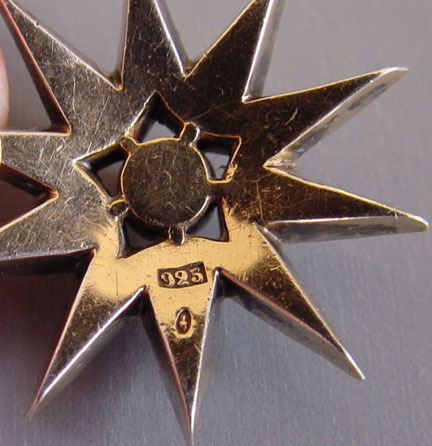 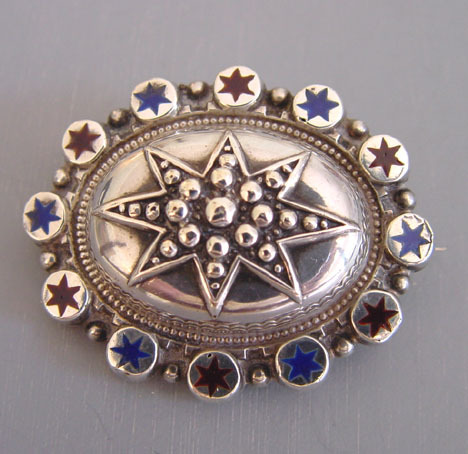 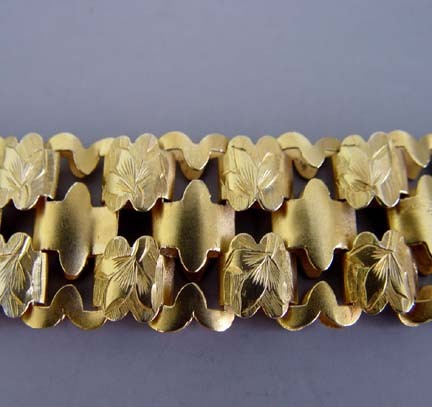 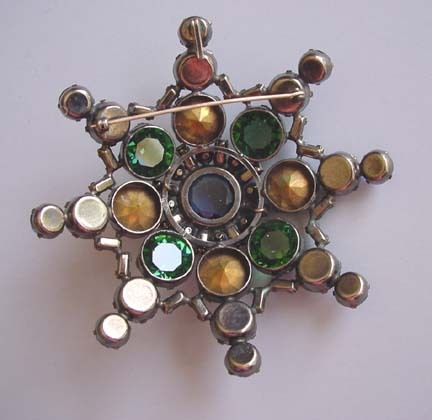 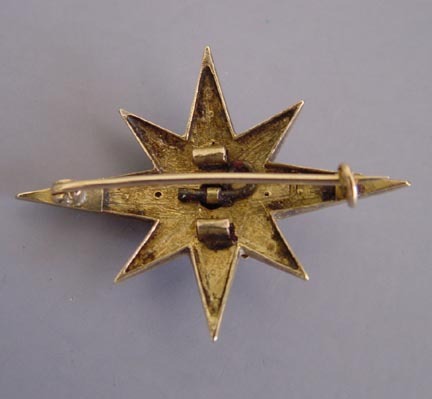 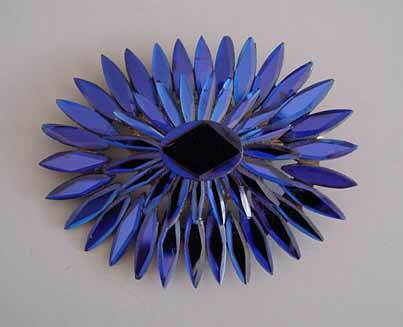 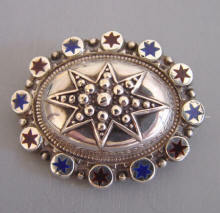 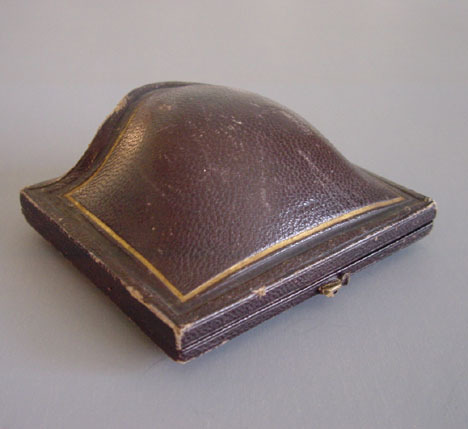 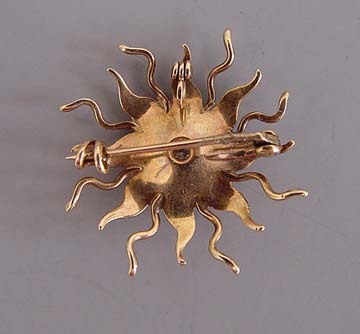 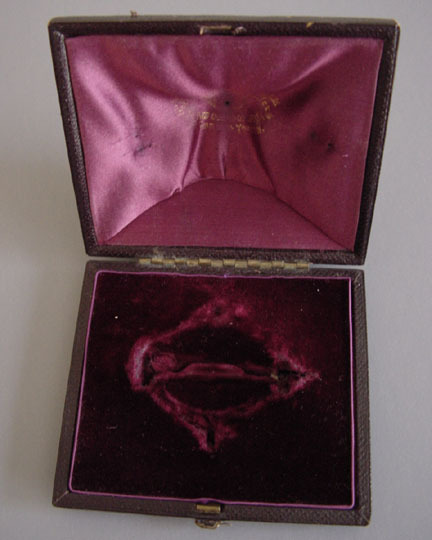 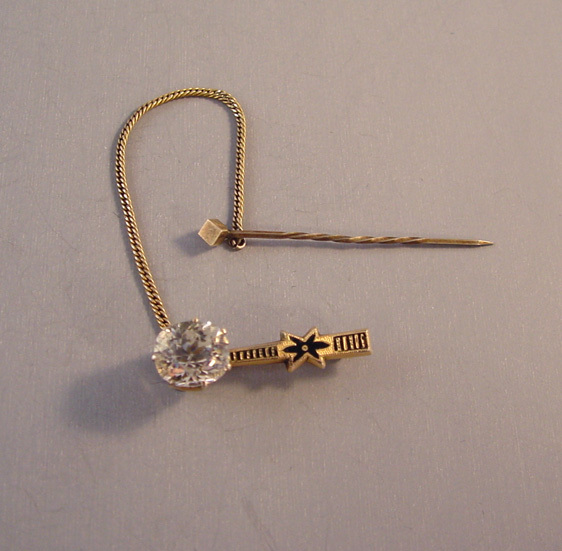 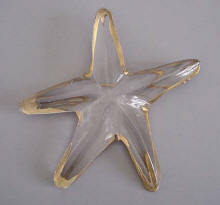 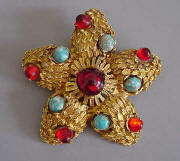 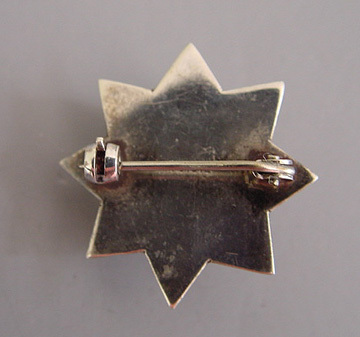 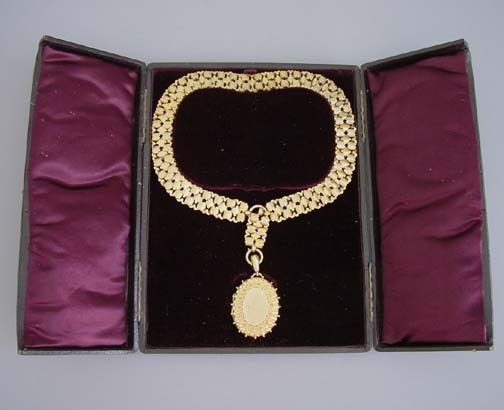 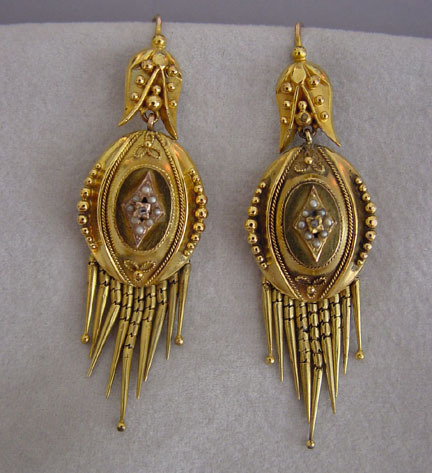 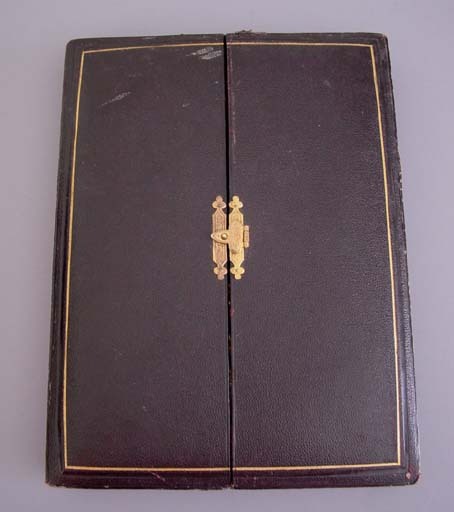 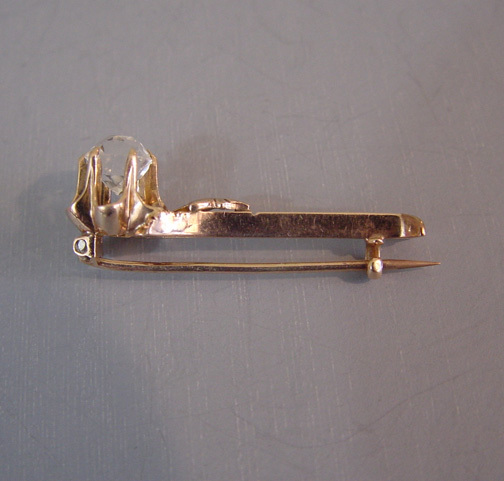 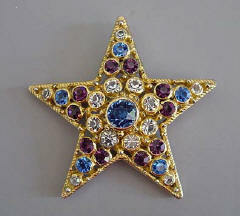 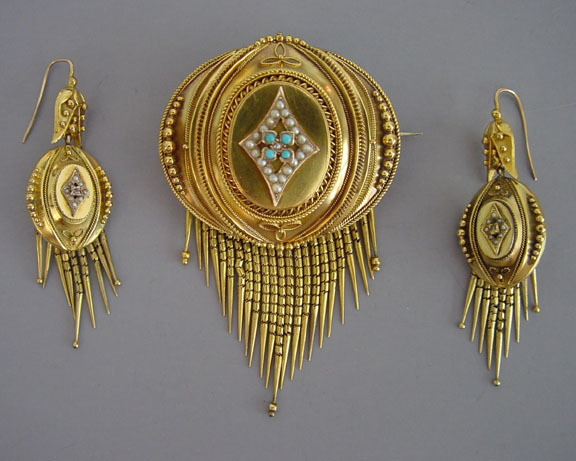 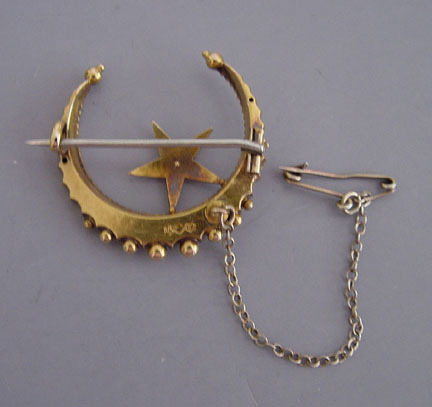 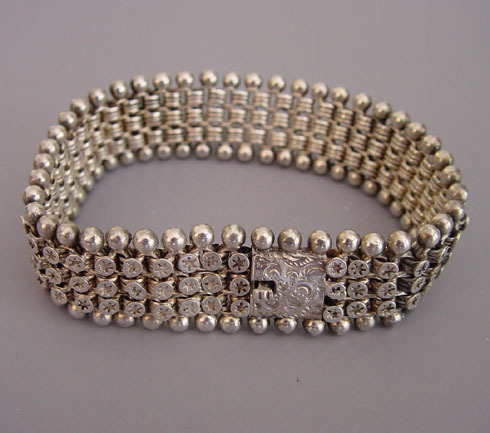 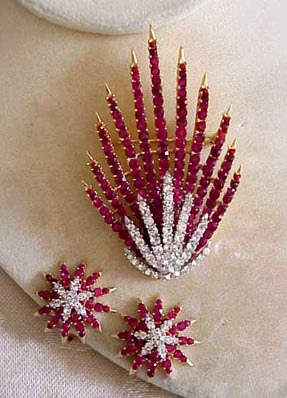 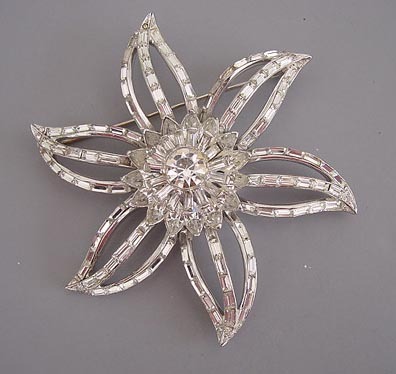 The brooch has substantial weight and is of excellent quality and condition. 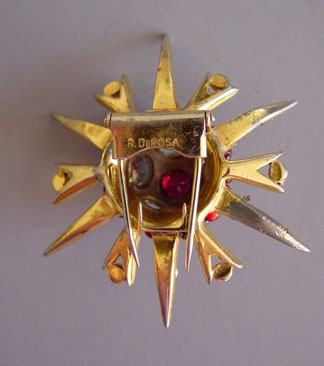 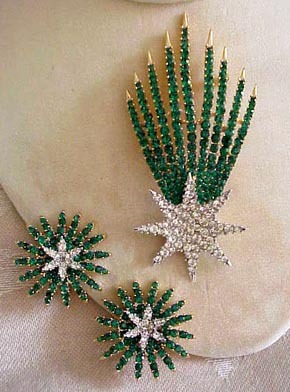 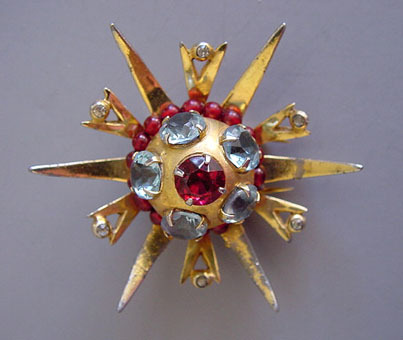 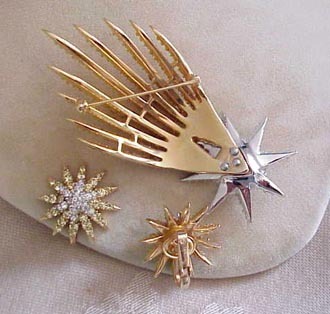 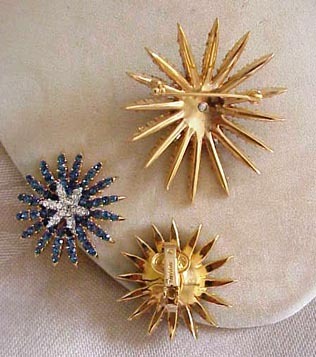 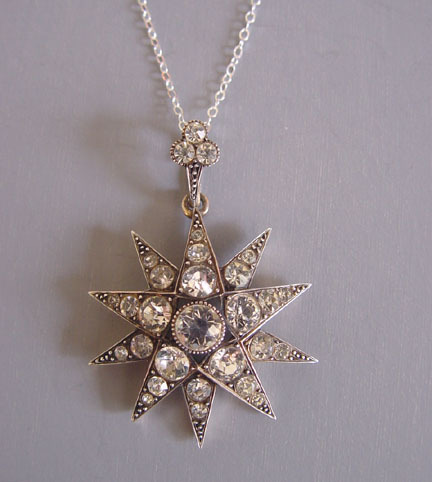 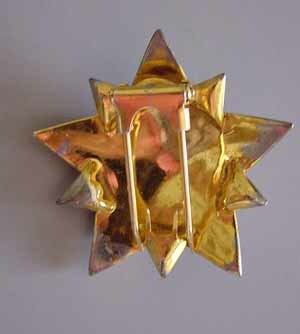 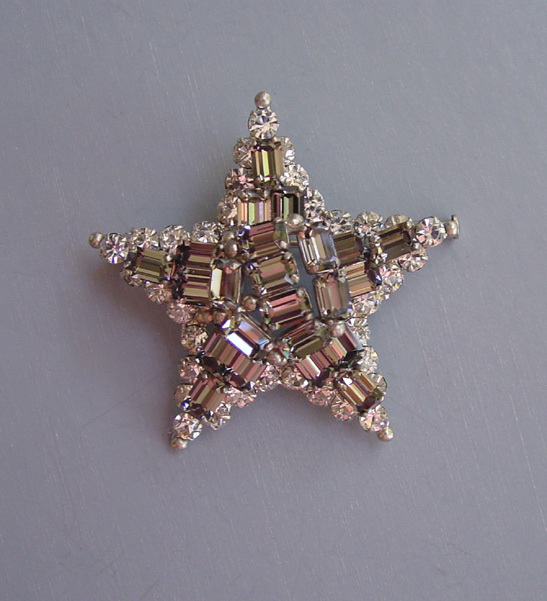 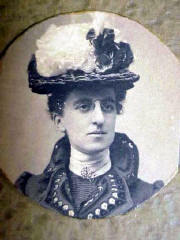 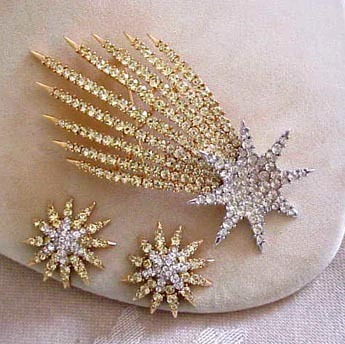 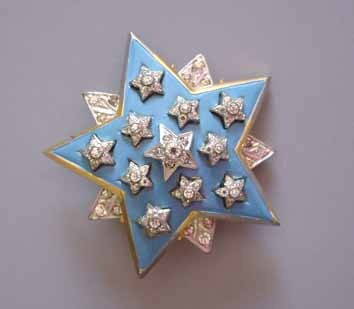 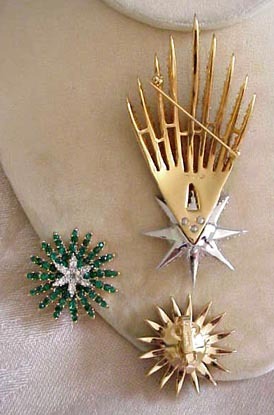 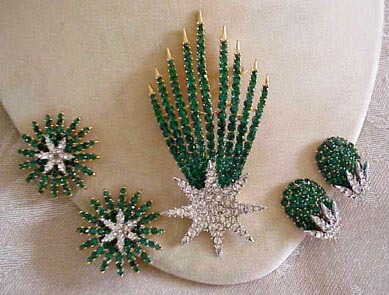 A starburst brooch centers the high neckline of her costume. 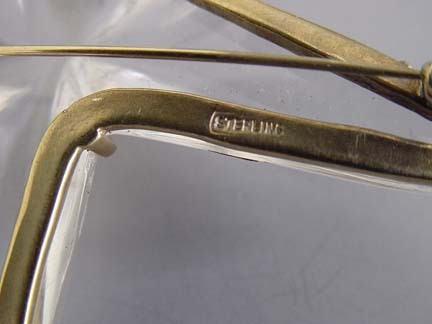 Note also her wonderful "specs". 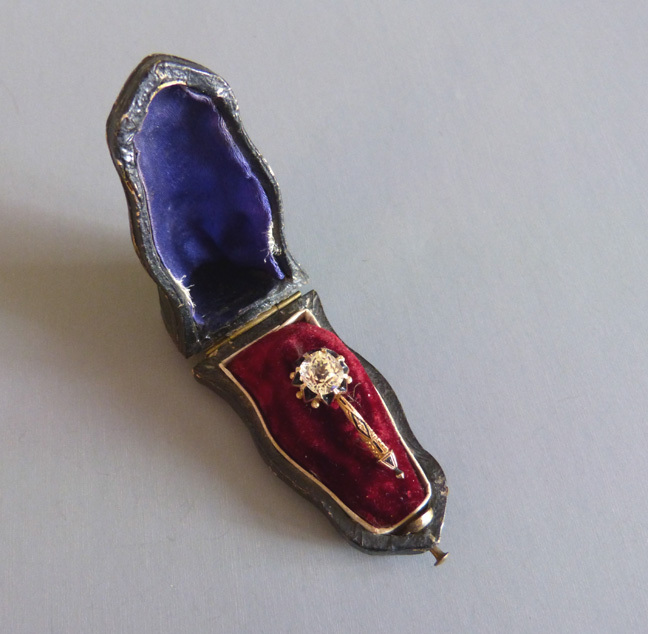 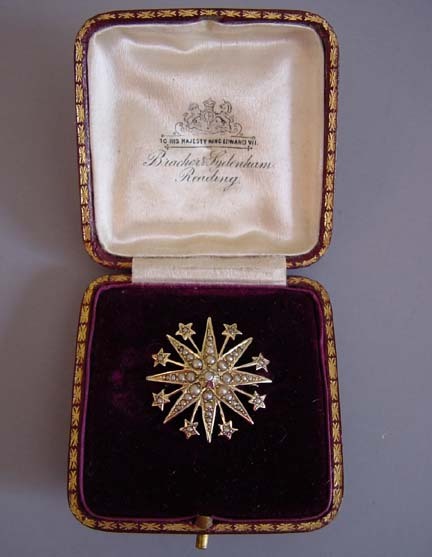 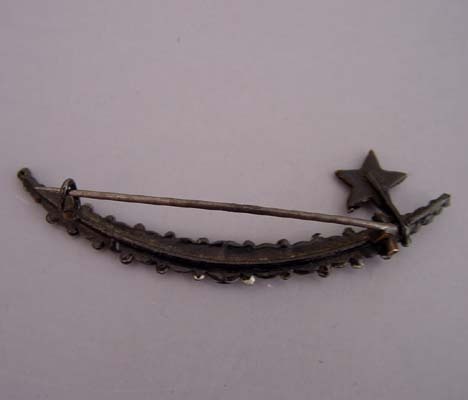 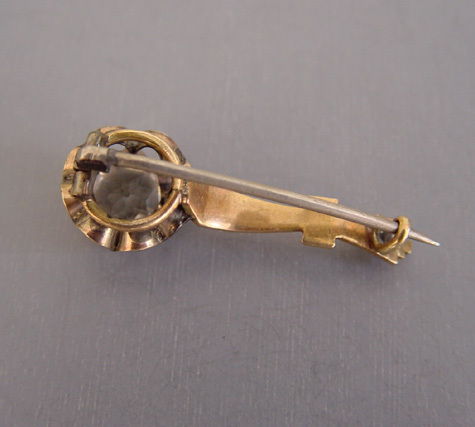 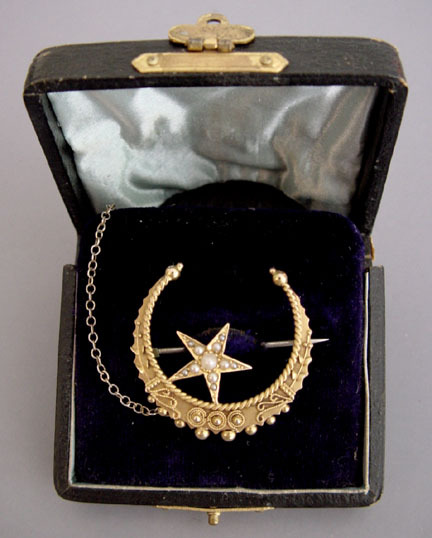 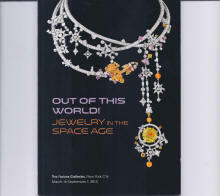 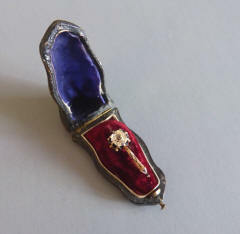 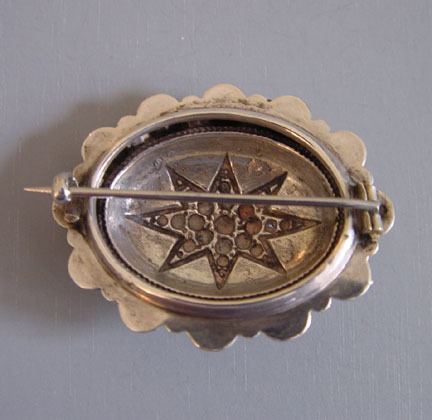 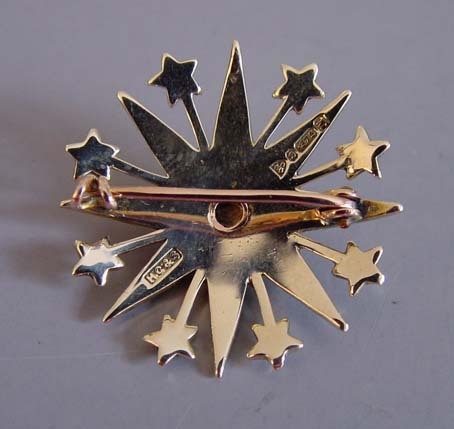 We were honored to have had one of our Victorian Halley's comet pins in included in this amazing show. 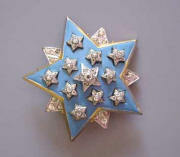 Trifari star series as seen in the 1966 catalogue. 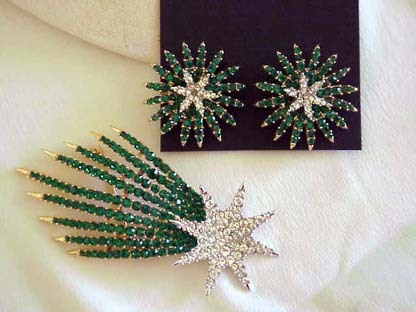 This has also been called the "Comet", and the "Starburst".